Many of the scenes in Charlie Chaplin's film, City Lights, were shot on the backlot and soundstages of the Chaplin Studios located on La Brea Avenue in Hollywood. 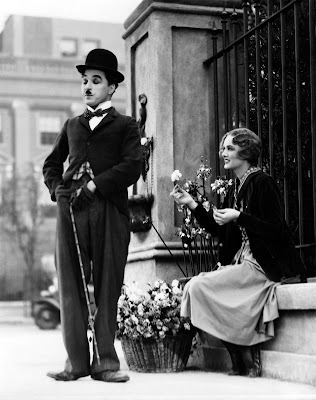 The screenshot above where Charlie first meets the blind flower girl, as well as the opening scene in the film where Charlie is found sleeping on the city statue were all shot at the Chaplin Studio. However, there were a few scenes shot around the city of Los Angeles. Above is a screenshot from the scene where Charlie and the millionaire go for a drunken drive around town after a night out. Below is a photo of how the same area appears today. Notice now there are the addition of trees and many more high-rise buildings, otherwise, the building on the left looks pretty close to the same. This building just happened to be right next door to the parking garage for my jeweler which made finding this building pretty easy. Just a block down from the above location is another location from the same scene. Above Charlie and the drunken millionaire are about to turn right onto Olive. I think it's interesting if you look in the below picture you will see that Olive Avenue is now a one way street. If Charlie and the drunk would have turned down Olive today they would have been heading the wrong way! Vintage Postcard, Town House apartment building. The millionaire's house is actually the Town House apartment building on the corner of Commonwealth Avenue and Wilshire Boulevard - not far from the other downtown Los Angeles locations. When Charlie receives a wad of cash from the millionaire he heads outside the building to buy flowers from the blind flower girl. Charlie races to buy flowers from the blind flower girl. Above is the same corner of the Town House apartment building as it appears today. The building is no longer used as an apartment building. Now it is available for film location rentals as well as wedding and other special events. In the above screenshot Charlie and the millionaire are driving down Wilshire Boulevard and are about to turn onto Berendo. The Gaylord Apartment is the large building in the background and is an easy landmark to spot. Above is another screenshot that shows Charlie and the millionaire making the turn onto Berendo. Another landmark that can be seen is the Immanuel Presbyterian Church. Above is the same intersection as it appears today. The church is still standing and so too is the Gaylord Apartments. You just can't see the apartment from this angle now because of all the trees. Above is a photo of Charlie and the drunken Millionaire now driving pass the Beverly-Wilshire Hotel in Beverly Hills. Below is a photo looking at the hotel today. 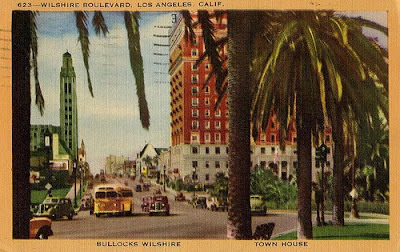 With the exception of the Beverly Wilshire Hotel, all the other locations are in very close proximity to one another. I recommend visiting the downtown locations early on a weekend when traffic isn't so bad and then do a drive to the other locations. Just don't follow Charlie and the Millionaire's example - drive sober! The photo of the old Chaplin studios really brings back memories. I knew it mostly as A&M records before it became Jim Henson productions. Not too far from that building -- but I can't remember what street it's on -- is an apartment complex built by Chaplin in a similar English style, designed to look like a quaint village. I saw it once but have long since forgotten where it is. Does anyone have a shot of the millionaire's home doorway? Where was that? Ironically I'll be Downtown today so I could correct myself but isnt 7th and Grand right near The LA Athletics Club where Charlie lived before he married (and after at least the first one fell apart)? I'm pretttty sure of it. Seems all those outdoor scenes were filmed near there then. God, I love these posts! When you watch an old movie it's so hard to believe that they actually filmed it in real places. City Lights is such a superb film, it may be Chaplin's greatest. Thanks for sharing. I'll have to look at some aerial photos and see if I can't find that apartment complex. I checked out that link. That's a great site - so much info. You're right. That is the same area as the LA Athletic Club. And there are many silent film locations around - other Chaplin locations, as well as Keaton and Lloyd locations. Practically every block in that area of downtown can be found in silent films - it's pretty cool to match the buildings up. I agree. I think City Lights is certainly one of Chaplin's best films. What a great romantic comedy. It's amazing how much Chaplin was able to accomplish without dialogue - such as coming up with a way for the blind girl to mistake Chaplin for the millionaire. oh wow robby--this is a fabulous post!! thanks so much for revisiting those sights--they are especially interesting because chaplin so much preferred on set shooting rather than location. to this day, i am known to take an unwarranted detour up La Brea on the way to work so i can sigh over the chaplin studios. Im sure Robby already has this but there is a series of books called 'Silent Traces' I believe all by John Bengston which traces Chaplin, Keaton, and Lloyd locations in CA. Its gorgeous! And made me even more giddy when I realized many of his shorts were shot on Broadway...so amazing. I adore Chaplin! Thank you for keeping the dreams alive by your love for all things Old Hollywood. I love your blog! Does anyone know where the Statue scene was shot and if the statue is still around?